I'm all about the easy cold app in the summer. These veggie pizzas have an element of cooking, but it's small so they count. I originally got this recipe from Carol I think. My aunt Sue makes them too and they are always a favorite. Fresh broccoli, grape tomatoes, bell pepper. Grease 9x13 baking sheet or use a non-stick sheet. Unroll crescent dough and pat down on sheet. Follow directions so they're just lightly browned on top (it's about 9 and a half minutes in my oven). Set aside to cool. In bowl, mix cream cheese, mayo, and spices. Beat until smooth and spread over cooled dough. Top with minced veggie toppings and shredded cheese. Cut with a pizza cutter. Refrigerate at least 2 hours or overnight. Other veggies may be added or substituted - I've used purple cabbage, carrots, green onions, etc. in the past. Like my cold dark heart. I really am not a fan of cooking in the summer, grilling not included so this is a great idea! The haiku hilarious as always!! The haiku!!!!!!!!!!!!! Love this idea for something relatively easy and tasty! The idea of using crescent rolls is genius. yes, yes yes to this. 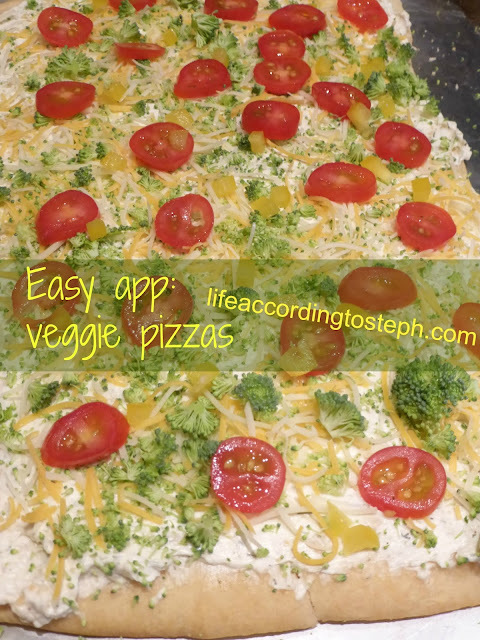 i love an easy app and i love veggie pizza. done and done!!! I love veggie pizzas! So delicious. So easy, I love it. Cold apps in the summer are the best. We love making homemade pizzas. 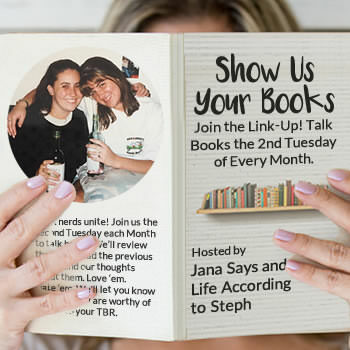 I like the idea of this one. This is a good summer recipe! This looks delicious! Perfect for summer! I never made homemade pizzas but using crescent rolls is a great idea and the cream cheese spread sound deish instead of red sauce. OH MY GOSH... this look amazing. I could eat the whole thing. Yum this looks amazing! 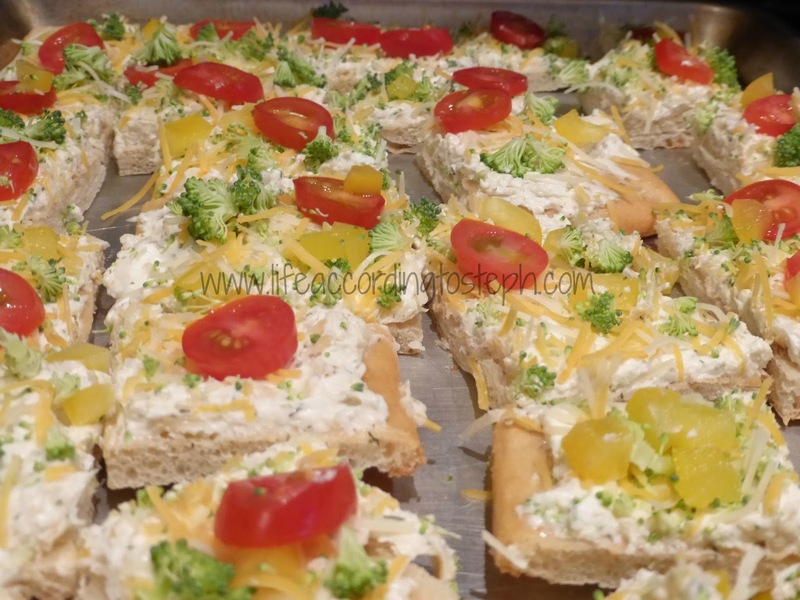 Using crescent rolls is a great idea for the next time we make homemade pizza!! YES PLEASE. I'm going to use this for my sister in law's shower in a month. I always eat this at parties, but I've never made it. Ohh summer pizza?! Looks delish!! LOLOLOL @ that Haiku! Also, I am with Kathy. Those post is just cruel :( I need that pizza in my belllllay. I love that you used a crescent roll dough for the crust. Freaking genius. I am going to go curse grains, excuse me. Mmmmm such a good idea. Would even be good for packed lunches for summer time too! another delicious dish. This looks easy enough for me! Holy crap, that haiku. I cannot stop laughing. I should make this. The time in the oven is under the limit I like to set for summer foods (usually less than 25 minutes) and then it's pizza. So. Yes. It works for me. These are such a good idea for the summer, quick, easy- and even with any choice of ingredients even my grandson could make them. Fun colorful post Steph! Oh. Hel. lo! this looks so delicious. Big fan of the cold app (which is usually dinner for me too, because lazy) over here as well. Easiest ever: sliced tomato, cucumber, red onion, avocado. Drizzle (or many drizzles) olive oil + salt + pepper + basil. Chill and nom. YUM! I freakin' love veggie pizza. My great-aunt makes one for every party/shower/holiday- very similar to yours. I think she always puts shredded carrots on top too, which I like- but not everyone is a fan of carrots! What a great summer idea! 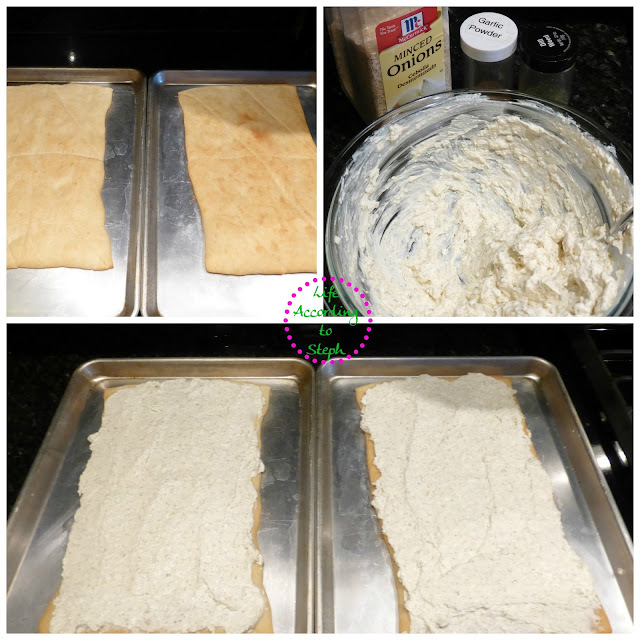 It's easy and the crescent roll dough is genius! I like the idea of the cream cheese as a base instead of a red sauce. Pinning! i always forget how much i hate cooking over a hot stove in the summer. so these are perfect. yum!